The M1 Series of handheld manometers from Meriam Process Technologies combines form, fit and function to deliver precision pressure measurement for field, plant or lab use. For reference indication and shirt pocket convenience, select the low cost M100 Digital Manometer with its +/- 0.25% FS accuracy. 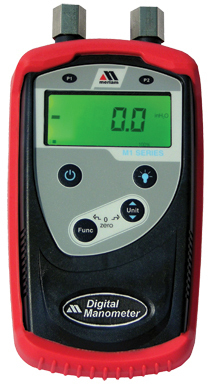 Or specify the M101 Calibrator when better accuracy is needed for more exacting measurements. The M101 delivers +/- 0.10% FS accuracy and additional features normally found on higher priced instruments. 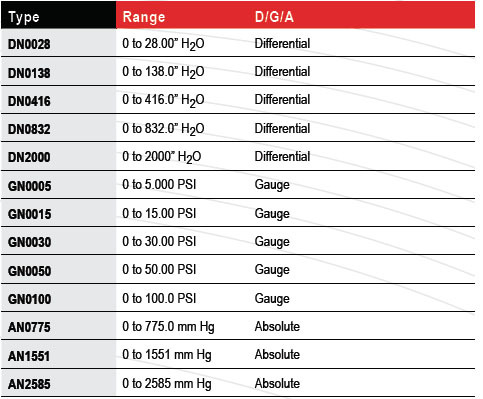 Both models are available in differential, gauge and absolute pressure versions. Inches of H2O @ 20C, mm of H2O @ 20C, mm of Hg @ 0C, Inches of Hg @ 0C, kPa, mBar, Bar, PSI and user selectable. Non-isolated sensor for clean, dry, non-corrosive gases. (DN) units - 3 x F.S. on high side only or 200 PSI, whichever is less. (GN or AN) units - 3 x F.S. range or 200 PSI, whichever is less. 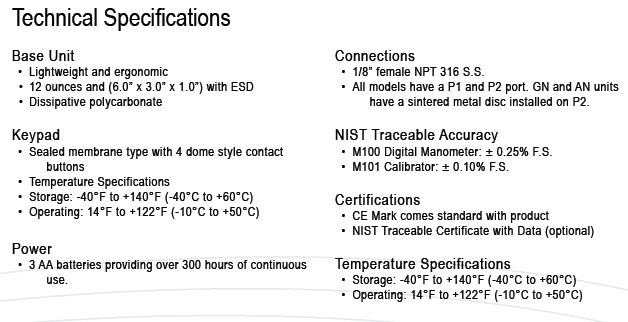 M101 delivers +/- 0.10% FS - No temperature effect over the entire operating range 14F to 122F (-10C to +50C). Displays the MIN and MAX pressures. Freezes the pressure measurement on the display, however, the bar graph is still active. Displays a continuous filtered average of the pressure measurements. Displays the internal ambient temperature of the M1 in C or F.
The M1 can store up to 240 pressure measurements. • Automatic - the current value is automatically stored every 5 seconds, for up to 20 minutes. • Manual - the current value is stored every time the Units key is pressed, up to 240 times. A green backlight is user activated via the backlight key. A red backlight is automatically activated during an error/ over range condition. To conserve battery life, the M1 will automatically power off after 20 minutes of keypad inactivity. M1 can be calibrated in the field for zero and span. BAT icon is displayed when batteries require replacement. Approximately 2 hours of run time is provided on a low battery condition.